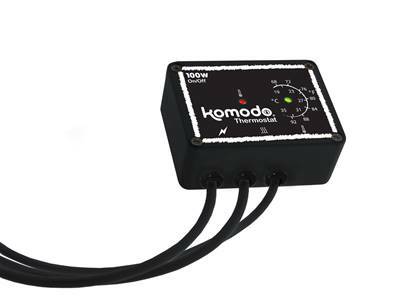 The Komodo Habitat Thermostat, is perfect for reptile and amphibian care. The Komodo Habitat Thermostat is suitable for controlling most heat sources including incandescent lamps, heat-mats and ceramic heaters up to 300 watts. Features an adjustable tamper-resistant temperature dial, audible and visible operational indicators and a three pin socket for easy connection to the thermostat. Guaranteed to precisely montioring air or surfact temperature to +/-1 degree Centrigrade. Designed to operate in all reptile environments from desert to rainforest and accurately controls the thermal gradient. Comes with installation and positioning guidelines.